We are four women in and approaching our 80s who have recently collaborated with biomechanist Katy Bowman (www.nutritiousmovement.com) to co-author a new book about how movement has changed our lives. We were in our early 70s when we met at Restorative Exercise classes in Ventura, California taught by Katy. Shelah came from a career as a graphic artist, Lora was a nurse and movement therapist, Joyce was a teacher and I was an elder law attorney. That was in 2010. At that time each of us had health issues that were affecting our quality of life and had us concerned about how we were aging. Almost immediately we were struck by the logic of Katy’s movement program and the science supporting it. 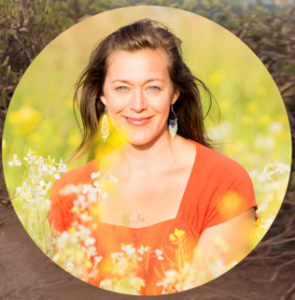 We were so impressed with her work, we soon became certified Restorative Exercise Specialists™ through a six-month training with Katy and we began teaching in various venues. Early on we began noticing significant changes in how we moved. For example, in our book, Lora talks about her restless leg syndrome completely disappearing and a knee replacement surgery that was avoided. Joyce shares that she was facing knee and neck surgery – neither of which has been necessary. Shelah talks about her choice to stop driving and walk everywhere and how she is able to cope with an injury as a result of learning Katy’s work and practicing it. My chronic constipation of more than 50 years disappeared and I was able to do away with my orthotics and walk barefoot again after 20 years. And so much more. We were amazed and excited to see we were actually getting better as we were getting older. Two plus years after we first met, we decided to get together monthly to write a book about our experiences. We called ourselves the Four Savvy, Sassy Septuagenarians and our meetings Soup & See’s (Dark Chocolates) because that was the menu! In early 2013, at the request of a student, we took what we thought would be a brief break from writing about our experiences to put together a manual of balance exercises. Nearly a year later, we ran our efforts by Katy for approval. She counter-proposed we collaborate with her on a substantive book regarding move-more move-better science and exercises “geared to a 50+ audience and anyone looking to improve basic whole-body mobility.” It was a no-brainer – what an opportunity – we jumped at the chance. To us, she is just Katy – our teacher and treasured friend. 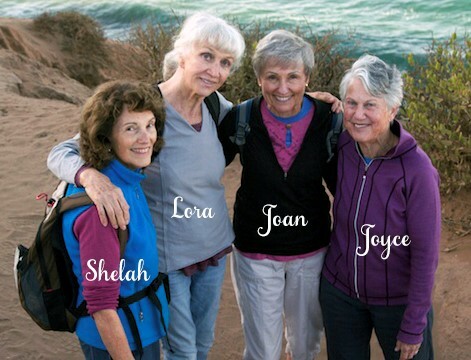 We share some of our personal experiences in our new book, Dynamic Aging: Simple Exercises for Whole-Body Mobility by Katy Bowman with Joan Virginia Allen, Shelah M. Wilgus, Lora Woods and Joyce Faber (available at www.amazon.com or at Katy’s website www.nutritiousmovement.com). We chose to start this blog because we want to continue to share our experiences of how we are living dynamically as the days and years go by and we continue our journey to move-better move-more! Katy wraps up our book in the last two sentences by explaining “why movement needs to play a large role in our life. It’s not so that we can age dynamically, but so that we can live dynamically.” We would suggest it is for both reasons – so we can dynamically age for as long as we live andlive dynamically for as long as we age. Thus the name of our blog Dynamic Aging 4 Life. I tell everyone who’ll listen to get this book for their parents but before they give it to them, to read it first. Thank you all for sharing the good news ? Okay, sending Kudos again. Love that you are doing this, Hats Off, ie Feet Straight! xo P. Lyn I await my email confirmation to subscribe. Fabulous launch of the blog. I am so excited for the continuing evolution of this project. Can’t wait to see more of how the fabulous 4 compose your lives. Joan and Willis (smart and supportive husband) have put together this dynamic website to which I’d love to contribute. I can joyfully report that in the last month I’ve travelled to Budapest and Utah. In Budapest I played, walked and went to spas while in Utah I helped my sister and brother-in-law move a 26-bed “cabin” to a farm-to-be. Both experiences gave me great pleasure because despite being in my 77th year I felt no limitations and could fully engage challenges as well as fun. Thank you to Katy Bowman and our little band of encouraging “Goldeners.” I hope the blog will make us a big band where we support, encourage, applaud and appreciate each other.